PORTRAIT OF THE ARTIST STRUNG OUT. Eau Claire-based artist CV Peterson, whose work ranges from painting to performance, deals largely in plastic scraps. When humans are gone from the earth, by their own design or by nature’s, our legacy will be our plastic. It will degrade in the sun and in the ocean, seemingly disappearing into microscopic scale, reforming as geological features as it fuses with other matter. Within this unrecognizable landscape will live an unrecognizable creature, evolved from plastic-digesting fungus strains, which will consider our waste a precious, nonrenewable necessity. This is the fiction of Eau Claire-based artist CV Peterson. On a mid-December day, Peterson could be found in her studio in Banbury Place painting, sculpting, and creating, wearing army surplus cargo pants and a side-zip yellow phaux-leather jacket. Her blue eyes were boxed under a shock of white-violet hair and centered between mismatched earrings made from metal gears that dangled nearly to her collar. But on a different day, one might find her at a gallery, or a house party, or even on a city street, writhing under layers of plastic fringe as she depicts the monster from her vision of post-human earth. Peterson’s work ranges from painting to performance, and has been displayed in the United States, Canada, China, Japan and South Korea. She specializes in environmental and biological art, using scientific exploration to examine and communicate themes of environmental devastation. “I knew I wanted to make a world, and perform in it,” she said. 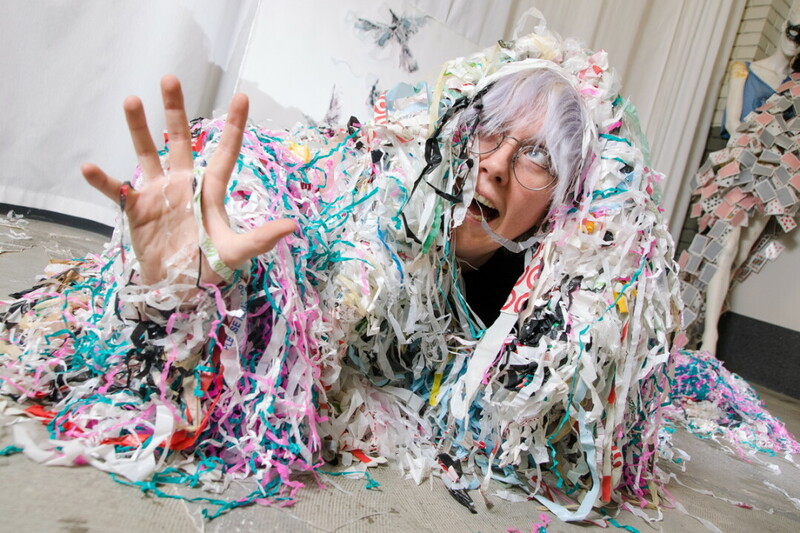 Peterson invites people to experience the post-human world she imagines by devising installation pieces, sculpting, painting, and performing as the plastic/fungus monster. “I’ve always been somewhat of a plastic fetishist,” Peterson said with a smile and a shrug. She went on to describe the huge impact plastic is having on the environment. Humans have produced 8.3 billion metric tons of it, and less than a tenth of plastic waste is successfully recycled. In order to explore the real and potential ramifications of the permanency of plastic, Peterson uses massive amounts of it in her work. “I enhance my plastic intake to show you, the viewer, that it is a bad thing,” she explained. Peterson’s studio is home to huge plastic bags full of plastic scraps, bottles, and streamers. She carries a ball of “plarn,” or plastic yarn, in her backpack. “I want to shock people,” she said as she gestured around the room at various other forms of plastic she has collected to use and to mimic society’s obsession with the material. When Peterson learned about the construction of the Confluence center in Eau Claire, she decided to move back to the Chippewa Valley from Chicago to start a studio. “I think the Confluence Center will, potentially, make Eau Claire a big art hub,” she said. And she wants to be a part of it. “Upon hearing of the Eaux Claires fest and their acceptance and promotion of conceptual installation art, I came to believe that the Chippewa Valley is a space where more conceptual and experimental art is becoming welcomed,” she said. Peterson sees a budding art community in the Chippewa Valley, and an opportunity to help it grow into something greater. Peterson is working to this end by engaging with local artists and art-related programs as much as she can. She is a member of the Eau Claire Regional Arts Council, and is working with Visit Eau Claire to make her studio a stop on an art tour of the city. She wants to give local talent a place to grow and thrive, as well as to start inviting international artists to be a part of the Valley’s renaissance. Peterson is currently building and organizing a retreat for artists from across the country and the globe to experience the piece of Chippewa Falls. The residency will be by invitation only. Peterson will work with willing guests to organize shows, workshops, talks, and more. Peterson is pleased to be surrounded by artists in Banbury Place. Her studio is a place for her to make art and make connections; she invites students, artists, and scientists to join her for tea and talk about art. Soon she will build into the unit to create a cozy meeting space where community members can join her to collaborate. Although she aims to evoke strong emotions in people with her art, which often results in scaring viewers or making them uncomfortable, she loves chatting and getting to know people through creating. More information about CV Peterson, including a list of her work and exhibitions, can be found on her website at cvpeterson.com. Her next local show will take place on Jan. 20 at 200 Main Gallery in Eau Claire.